Enjoy your favorite music whenever, wherever you like! It’s easy to save and play your favorite MP3s. Games: Dazzling widescreen LCD brings gaming to life! Over 135 game titles available including GANGS OF LONDON, SYPHON FILTER, FIRED UP. LEMMINGS, SUDOKU and more! PlayStation Portable E1004/B Enjoy your favorite music whenever, wherever you like! It’s easy to save and play your favorite MP3s. Games: Dazzling widescreen LCD brings gaming to life! Over 135 game titles available including GANGS OF LONDON, SYPHON FILTER, FIRED UP. LEMMINGS, SUDOKU and more! All this in the palm of your hand! The PSP® (PlayStation® Portable) system is the first truly integrated portable entertainment system designed to handle multiple applications – music, video, photo, and with games as its key feature. 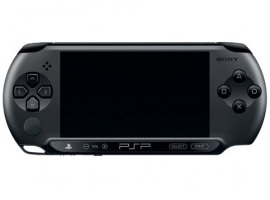 To Recieve updates and possible rewards for Sony PSP E1004/B please sign in. To Recieve updates and possible rewards for Gaming Console please sign in.